It is so easy to get caught up in the day and lose sight of what you should be doing for your patients. You should be trying your best to make life easy and less confusing for them. I’m a realist, I know there are times when this does not go to plan. But you do want life to be less confusing and easy for your patients MOST of the time. One particular time that can easily become confusing for your patient, is when you are about to make an appointment for them. Now for some reason the simple act of making an appointment with a patient who is ready and willing, becomes a confusing and difficult. as well as suiting your patient, the appointment time MUST also suit your Appointment Book. When you make an appointment for your patient, the appointment MUST suit both your patient and your Appointment Book. Very often the Appointment Book gets forgotten. I know this is easier said than done when you have a patient demanding appointment times on the phone or in front of you. Making your patient an appointment can be very straight forward and easy, but this is what I see happen in many Dental Offices. The patient is offered a “shopping list” of appointment times to choose from. The best way to confuse your patient is to give them too many choices. Can you see how this will now start to happen. 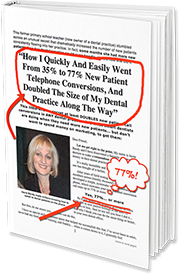 This may be happening unintentionally, right now in your Dental Office. The other way I see patients getting confused when trying to make an appointment is when the front office coordinator starts to play “Appointment Tennis” with the patient. You know, most of the time they don’t ring back! You want to remove all possibility that your patient will ever feel confused and put making an appointment into the “too hard basket”. Start looking at your Appointment Book so you are prepared to make appointments for your patients. At all times make a rule. BAM! The appointment is made quickly, easily, with no confusion!